There are many benefits of using banana plugs with your speaker wire. Not only do they help your installation to look cleaner, banana plugs also give you a permanent and high quality connection. Often bare speaker wire connections are unreliable. Wires tend to get pulled out or frizzy as time passes, which can affect your sound quality. With banana plugs you ensure this won't ever happen. Another benefit comes when you are doing behind the wall installations and using wall plates (as opposed to just leaving a big hole in the wall). These wall plates will generally just have a jack for a banana plug. Banana plugs also will help the back of your speakers and receiver look nicer and reduce the messy look of all the wires. 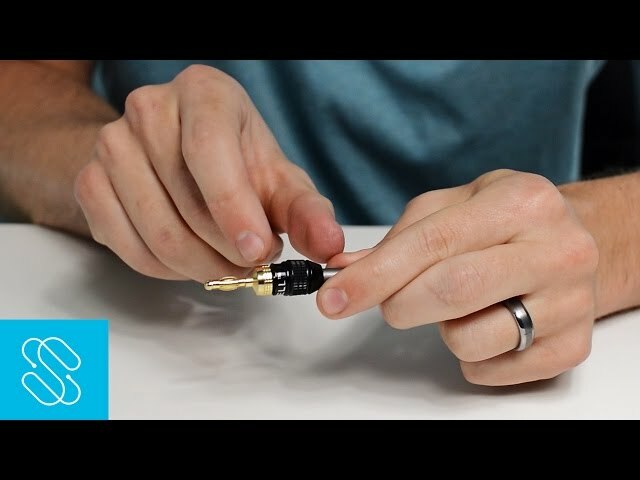 The following guides demonstrate how to install our Strike quick-install banana plugs and our Ocelot side-entry banana plugs. Many of the steps will apply to our other models, but you should also check out the connection diagrams for our other models on each of their respective product pages. The first thing you'll need to do is to cut the wire to the length you need. If you're running the wire behind the wall, do so before attaching the banana plugs. When you have the correct length of wire, pull one end away to give yourself room to work. You will need to be able to work with each individual wire in the pair. In order to make this easy, pull the wires away from each other so you have one or two inches of separated cable. Place the cutting edge of the wire stripper about 1/2 of an inch away from the end of the cable. Let the force of the arm on the stripper put pressure on the cable as you spin the stripper around the cable to strip away the jacket. Peel the cut jacket off the bare wire and remove the cable stripper. This will expose the bare wire so you can attach the banana plug. Repeat the above process on the other wire, using the wire stripper to cut the jacket about 1/2 of an inch from the end of the cable. Once you have stripped both cables, you will be able to attach the banana plugs. You will no longer need the wire stripper. In order to easily feed the wire into the banana plugs you’ll need to twist all of the copper strands together. Place one of the sets of wire between your finger and thumb, then slide your finger across the top to cause the wires to twist around each other. Once you’ve twisted the wire strands together you are ready to attach the Strike banana plugs. Each pair of cables will use a red striped banana plug and a black striped banana plug. The banana plug with the red stripe will attach to the grey cable with the red stripe printed on it. The other banana plug will attach to the black cable. Take the banana plug with the red stripe and unscrew the bottom about half way and feed the speaker wire into the bottom of the banana plug. Keep pressing the cable into the banana plug until you can’t push it any farther. There is a cone at the front of the plug that spreads the wires in the speaker cable out to ensure a good connection. If you don’t push it in far enough, you won’t have as secure of a connection. After you’ve fully inserted the cable, screw the back of the banana plug back down. This will twist the wire farther into the plug, giving a strong connection. If you have properly fed enough wire into the banana plug, this should tighten down on the wire and keep it from falling out. Repeat this process for the other banana plug, making sure to insert the cable in as far as you can to ensure a strong connection. With both speaker cables inserted and secured in the banana plugs, simply connect the plugs into the back of your speaker or receiver. Using the wire stripper place the cutting edge about 2 inches away from the end of the cable. Let the force of the arm on the stripper put pressure on the cable and then spin the stripper around the cable a few times to cut the outer jacket. With the jacket being cut, simply slide the jacket off the end of the wire. This will expose the two inner wires. Also, remove the wire stripper. You'll now see the red and black wires which are what will carry the audio signal. The red line is used for the audio signal and the black wire is for the electrical ground connection. We will now need to be able to work with each individual wire of the pair. In order to make this easy, untwist the pair of wires and pull them away from each other. We now need to strip the jacket off of the copper wire. Place the wire stripper about 3/4 of an inch from the end of the wire. Just as before, rotate the stripper around the wire a few times in order to cut through the jacket. Pull the cut jacket off of the bare wire and remove the cable stripper. This will expose the bare wire that we need to work with. We need to repeat what we just did; doing it to the other wire. Use the wire stripper to cut the jacket about 3/4 of an inch from the end of the wire. Once that is completed, we will have the exposed wire on both wires. This is exactly how the cable needs to be for us to use the banana plugs. We will no longer need the wire stripper. In order to best feed the wire into the banana plugs we want the wire to be twisted. Place one of the sets of wire between your finger and your thumb. Then slide your finger across the top, causing the wires to twist around each other. Here is the pair of banana plugs we will be using. These banana plugs can be used in two different ways. You can install the wire through the back of the plug, or through the side. We will show both methods. We will show the method of feeding the wire through the back first. First, unscrew the back of the banana plug. This will make room for us to feed the wire into the front of the plug from the back. Feed the speaker wire through the back of the open banana plug until you feel it reach the front of the plug. We need to get the wire to fill the gap between the front and back of the banana plug. You can do this by applying more pressure to the wire being fed through the back. Keep pressing until you see the wire start to spread out inside. If done correctly, the wire will appear to fan out in all directions. With the wire filling the open gap, screw the back of the banana plug down. If you have properly fed enough wire into the banana plug this should tighten down on the wire and create some pressure on it, keeping it from falling out. Now, let's look at the simpler, but less clean looking, side method. Just as before, unscrew the back of the banana plug to make room for the wire. Insert the wire in through the side of the banana plug, pressing the end of the wire against the front of the banana plug. With the wire in place, screw the back of the banana plug down. This will then secure the wire in place by pinching it between the screw and the side of the plug. Join the Sewell Insider program and get 15% off banana plugs!